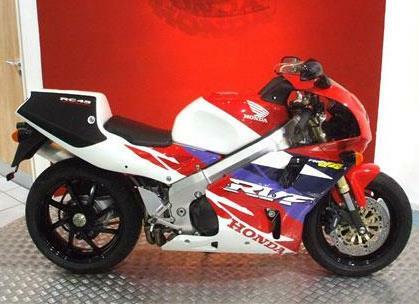 This brand new, 0-mile, unregistered Honda RVF750R has come up for grabs on MCN Bikemart priced at £24,995! More commonly known as the RC45, the iconic V4 superbike was launched in 1994 as Honda’s successor to the legendary RC30. Essentially a homologation special built to challenge in World Superbikes and World Endurance racing, the RC45 is considered the ultimate Honda racer for the road, bristling with high tech. Yet although unquestionably faster and more sophisticated than the RC30, the ‘45’ never quite achieved the same level of success on the track, or admiration from afficienadoes. Its greatest claim to fame is a single WSB title in the hands of John Kocinski in 1997. The model was deleted from Honda’s line-up in 1999 replaced by the SP-01 V-twin.